Although the multi-level extensions to the parser and typechecker (-XModalTypes) are quite stable, the flattening pass (-fflatten-hetmet) is still quite experimental. There are many cases which are not yet implemented. You have been warned! 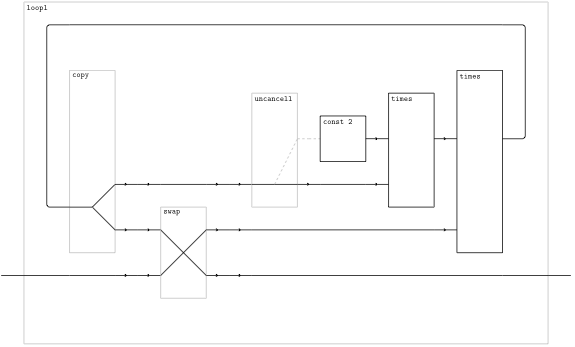 All diagrams below were produced by simply compiling the code as shown with the -fflatten-hetmet flag and instantiating the result with the GArrowTikZ instance (which does the rendering). Here are a few examples to give people an idea of what the flattening process for generalized arrows looks like in real life. Dashed lines represent inputs and outputs whose type is the unit of the generalized arrow (roughly analogous to () in Haskell). The GHC pass that performs the translation is written in Coq, and is formally proven to be type-correct: the result of the flattening process is always a well-typed term whose type is derived in a predictable way from the type of the term and the types of its free variables. The image above is rendered in a mode which omits ga_first, ga_second, ga_assoc, and ga_unassoc. You can find the “verbose” diagram, which includes these elements, here. All examples above come from modules compiled with -fflatten, the new GHC flag which enables the flattening pass on a module-at-a-time granularity. Functions in the flattened module are then called by a non-flattened module DemoMain which uses GArrowTikZ (which in turn uses TikZ, lp_solve, and pdflatex) to render them. You&apos;ll notice that these modules also use the flag -funsafe-skolemize. This enables a skolemization pass before flattening, which attempts to convert first-order functions (values of type t1->t2 where t1 is not a function) into let-bindings. If successful, the resulting generalized arrow term will not use ga_curry or ga_apply; this is important if you want to get “boxes and wires” diagrams, because ga_curry and ga_apply leave you with diagrams that don&apos;t yield a whole lot of insight. The -funsafe-skolemize flag has “unsafe” in its name because it is technically unsafe in the presence of certain kinds of polymorphism. Basically, if you have a type variable which appears in a code type, don&apos;t ever instantiate it with a type that is a function. The type system ought to check for this, but it currently does not. The -funsafe-skolemize flag automatically enables the -fflatten flag, which in turn automatically enables the -fcoqpass flag. If you use -fcoqpass by itself, GHC will simply convert the CoreSyn to HaskProof and back – this is used to check for bugs in the “glue code” that connects the Haskell world to the Coq world. The flattener alters the type of the expressions on which it acts. The final program mixes both flattened code (the demo function, whose type is a multi-level type) and unflattened code (the tikz function, which expects an argument of GArrow type). Prior to flattening, the combined program is not actually well-typed – it tries to pass a multi-level-typed term to a function expecting a GArrow term (try removing -fflatten and -funsafe-skolemize and see what happens). Therefore, we typecheck the modules separately, flatten one of them, and then link the results – by the time we get to linking the program as a whole is well-typed. The “free variables” wire is always produced, even if the term has no free variables (in that case there is one wire of unit type rather than no wires). Non-function types are treated as functions with one argument of type (), so we get an extra wire here too. Wires are produced for all free variables, even those bound from outside the code brackets. The latter kind of variable is represented by a unit-wire; ideally it should be represented by no wires at all. Overall, it&apos;s often easier to prove a verbose translation correct than to prove a clever one correct – the induction hypotheses are simpler and have fewer cases. Since the “equational theory of the initial premonoidal category” is a rather simple theory (you can&apos;t encode anything like arithmetic in it) I strongly suspect that there is some sort of normal form criteria and a reasonably efficient normalization procedure. GHC reserves the right to mangle the syntactic order of expressions however it pleases, so I can&apos;t be sure that the left-to-right order of the core expression handed to the flattener actually matches what the user typed. This might force me to move away from basing the flattener on GHC at some point – though I would prefer not to. It turns out that escaping a term and then immediately applying it to variables of non-function type is a special case which can be flattened without needing GArrowCurry/GArrowApply. However, as a side effect, arguments are evaluated in right-to-left order as they appear in the original program text. I&apos;m working on getting a better handle on these issues; I think they can all be eliminated.